Its been a big year. Young Agrarians has turned from a seed into many plants as we work with more and more farmers and organizations across BC. The work growing the network is good, and admittedly stressful. The issues that new farmers face are various from access to capital and land, to the complexities of business start-up in todays economy, to the overwhelming need for consumers to get educated about where food comes from- and why certified or uncertified organically grown food is important to our local communities, ecologies and economies. Generally speaking, the cost of production for small scale certified or uncertified organic producers in B.C. is higher than the return on investment in the first five years in many cases. However, if you factor in social and environmental capital into the cost/benefit analysis, ecologically grown food represents a huge benefit to us over all and is key to our long-term ability to weather climate change and feed ourselves. In B.C. and elsewhere, organics are costly for farmers to produce and consumers to buy because of the high cost of production – B.C.’s land values are almost double other provinces in Canada and farm inputs are expensive (feed, infrastructure, seed, etc.). The ecological farmer today has lost much infrastructure compared to days gone by including agricultural extension services (govn’t paid farm scientists or agrologists that supported farmers to develop their farm operations). There is a deep need for change if we want the next generation to be able to work the land regeneratively. We need many more people to support food systems we grow with our hands and purchase from local producers. Our home is on First Nations land in Canada. Indigenous food sheds and lands, which in many places have been contaminated by industry and increasingly altered by climate change- need to be stewarded not destroyed. I believe we can work collectively to better understand and support our foodsheds and peoples to grow and regain resiliency over time. There are a lot of barriers to small food producers, fishers and ecological farmers to get on their feet in the current economy. We have a lot of work to do to transform our foodsheds into healthy community-driven (grown, purchased, distributed, supported and locally financed) food systems. My deep hope is that the food movement will continue to grow and flourish and make for a healthier food system in the years to come. 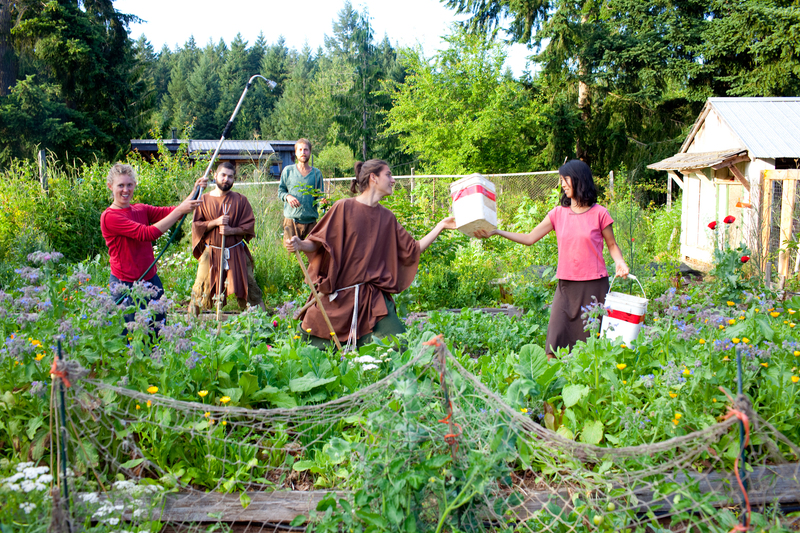 The young agrarians networking we do on farms, through the tours and potlucks that we co-host with farmers, community allies, organizations and agro-ecology educational centres in B.C. – along with our fall land linking events (bringing together land owners with land seekers) and winter young farmer mixers, aim to build relationships and connections to nurture collaboration and support new growers. I have been fortunate to travel to different parts of BC and meet people and learn more about what people’s challenges, successes and dreams are. This last adventure took me to O.U.R. 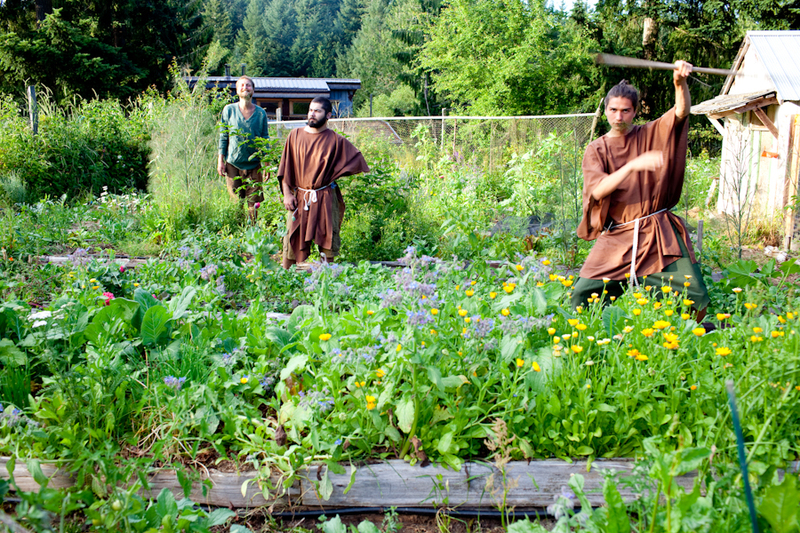 Ecovillage on Vancouver Island. O.U.R. Ecovillage offers internships and apprenticeships in ecological building, permaculture design certification, gardening, homesteading and much more. O.U.R. is at the heart of land reform in British Columbia having recently won a new land zoning designation that allows for the building of multiple dwellings on one property without having to subdivide. Me and the garden interns made some photo art together. Photos of: Asivak Koostachin, Hasi Eldib, Morgan Eichwald, Ian Giesbrecht and Obang Seungyeon. I’m not a vegetarian myself, though, like many people we know, we eat less meat then we used to. This film might make you think about where your food comes from and the relationship between “cheap” food and why it is cheaper than buying ethically-raised. This healthy Tex-Mex King Ranch casserole recipe is typically made with cans of cream-of-something soup. We’ve lightened up this casserole recipe considerably by making a homemade cream sauce and loading it up with veggies at the same time. You’ll never guess that a serving of our version of King Ranch casserole has 300 fewer calories and two-thirds less fat than the original. This recipe makes enough for two 8-by-8-inch casseroles (four servings each)—have one for dinner tonight and freeze the other for a night when you don’t have time to make dinner. This rosemary-infused lentil and greens recipe is a perfect topping for toasted bread. Serve as a vegetarian main dish for 4 or a hearty side dish for 8.